This was another piece I was trying to translate into crochet and I must say I'm in love with this one. I don't know if it's the color (#9454)? Or the collar? Or the ease in that it worked up?! Do you ever make something and when you finish look at it and think, wow! not bad! That's how I felt with this one. So the yarn, once again Cascade Magnum, 2 skeins. This was worked top down and is one size although modification is easy and is noted in the pattern. It's the crochet version. I designed this one first then modified it for a knit version as seen in #4(knit version). Hope this helps! So, is an S, U, or V ok or do we need one that is close to 50 mm? Do they even make hooks that big? Very confused. 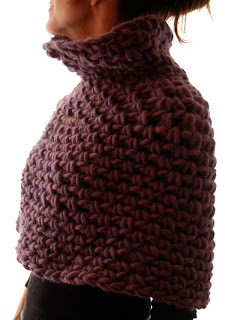 I have the pattern and the yarn. I just need to get the hook. Thanks! Hi Kimberli, sorry for the confusion! I would use an "S" hook. They do make hooks bigger than that and if you were a super tight crocheter I would go up a hook size but an "S" hook is the one you want. Thanks! Hi Alinka, "Pm" means to place a marker; "rnd" means round & "sp" means space. Hope this helps! 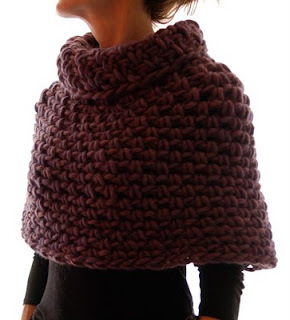 I just purchased the crochet pattern for MagnumCapelet#4. I believe is worked in spiral and from the top down but I don't understand how can we start with a 30 ch. When joined there is no way I can fit my head through the hole. Am I misunderstanding something? Thanks.